Well I was asked if I was going for a year without blogging and realised I was close to achieving this. So a very quick post. 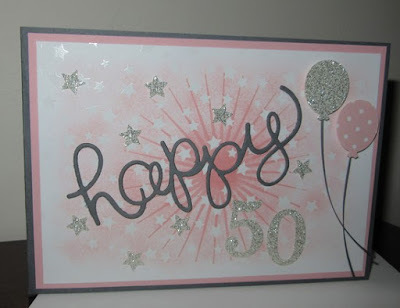 Here is a couple of cards I did a while back for a couple of 50th's I attended. 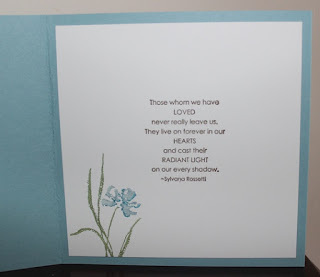 I cased these cards from the very talented Teneale Williams. Just changed the colours. I love the Irresistibly Yours specialty designer paper. My son had a birthday party to attend for twins earlier in the month and I thought Rev Up the Fun was perfect for them. I could make something different but still similar. Whisper White and More Mustard. 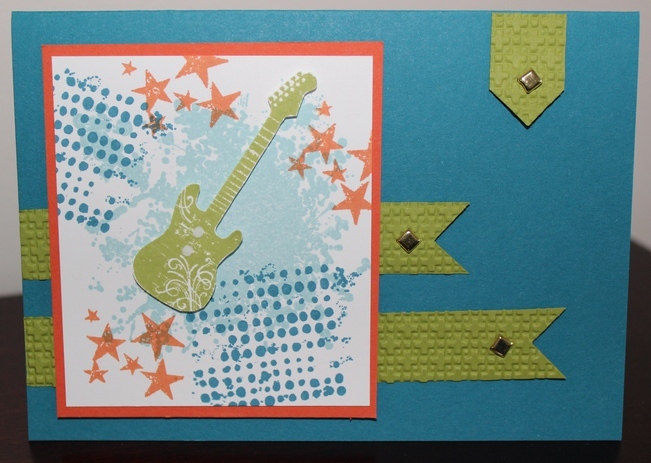 The stars are from the stamp set Extreme Elements. The next card I cased, but I can't remember who from. I have changed the base colour to Island Indigo and added a sentiment in the label bracket punch. You can't see it very well but the side piece of Island Indigo is actually textured card stock. I know a long time between posts. What can I say each week seems to fly quick than the last. Anyway I thought I would share a baby card I made recently with the Baby We've Grown stamp set. 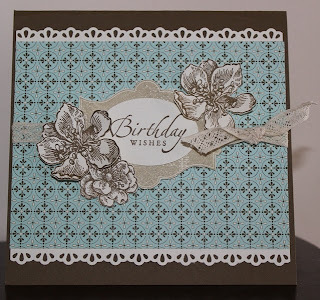 I have fallen in love with this stamp set so I might show you a few more cards from this set in the near future. I have used the colours Baked Brown Sugar, Soft Sky & Whisper White. 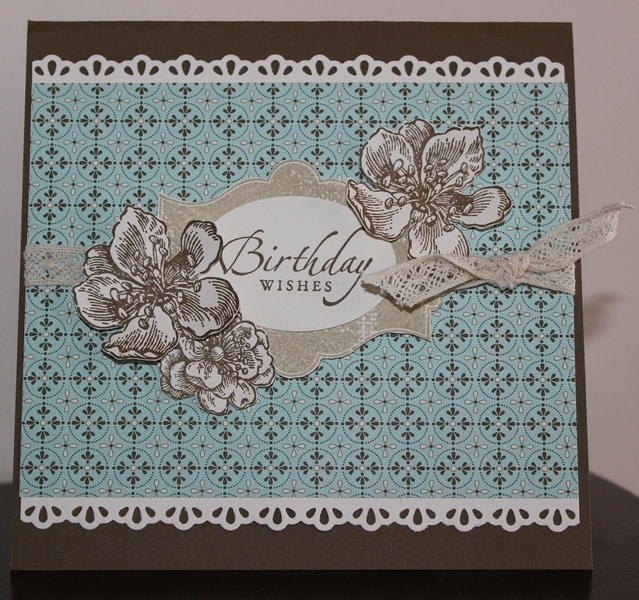 The embossing folder is decorative dots - another favourite and the starburst framelits. It is very simple but I like it. Enjoy the remainder of your day. 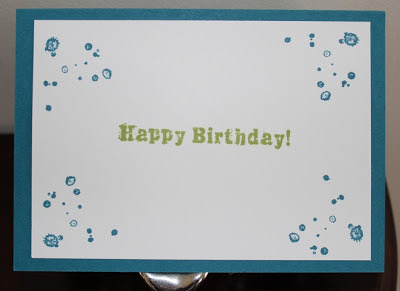 Today is a quick post, but you only came to look at the card so I guess that is ok. 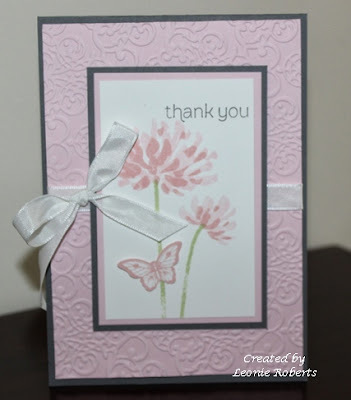 The card was produced with me having a play with Happy Watercolor stamp set and Sweet Sorbet dsp. 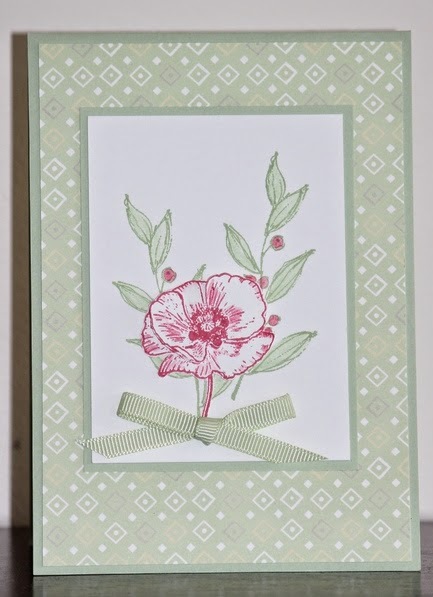 I don't know if you can see from the photo, however I stamped the poppy twice and cut out, layering a section of the poppy on top of the other. Yes I know it has been a while, well I am going to show two cards today. The reason behind this is because I made the first card for a party my 5 year old son was going too. 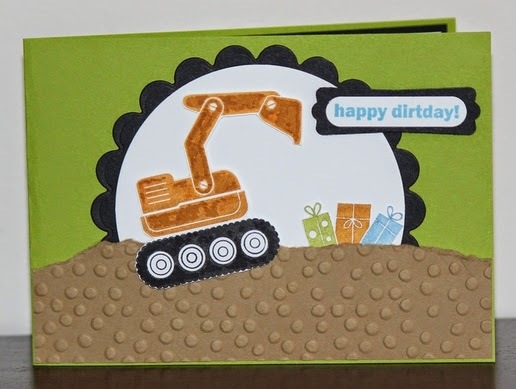 Thinking 5 & 6 year old boys would love a digger. Well my son took one look at it and said 'can't you make a Skylander card'. 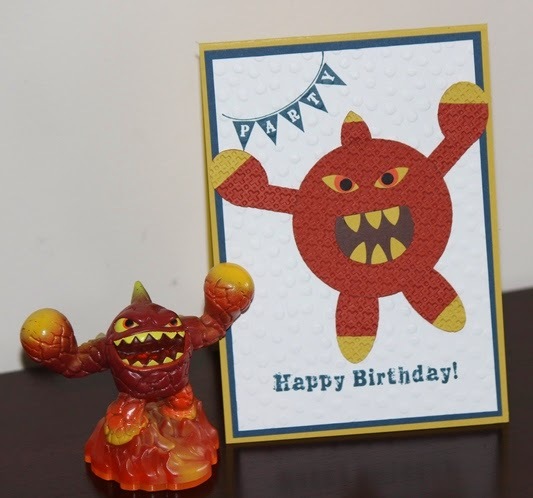 So I then spent the morning before the party trying to make a skylander card. The whole family got involved (well with opinions anyway) and the skylander card was produced. I don't know if you know anything about skylanders but this is meant to be Eruptor. He did go off to the party very happy and I just hope the card lasts more than 5 minutes. Are you enjoying the holidays. The lead up to Christmas and Christmas has been so busy here that I have felt almost out of control. We have also just celebrated a 10th birthday. Well the hectic time is over for another 12 months. I have had a day just after Christmas that I have had a play with my stamps though. 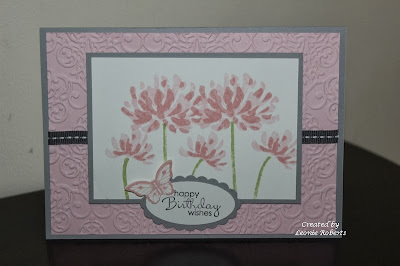 I was inspired by Jenny Moors (Stamping Moments) cards she did using the Two Kind stamp set. 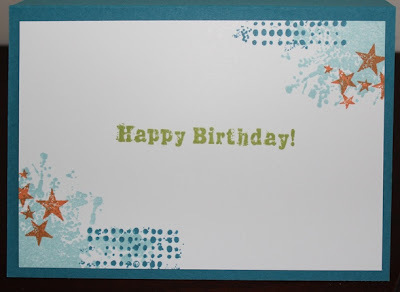 I loved them so much I bought the stamp set and made the cards. I thought the colours were so pretty together that while having a play the ideas were flowing so I just kept making a heap (eight more so far) using them as a base and then just mixing up the layout. Here are a few different ones I created, I hope you like them. 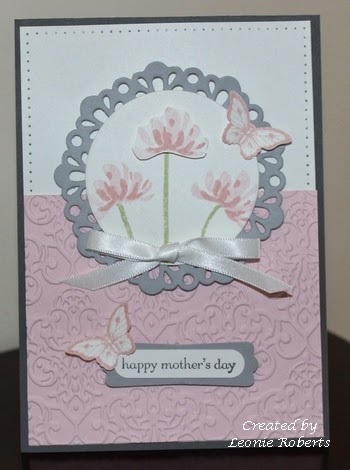 As you can see I have added different sayings and a few butterflies. 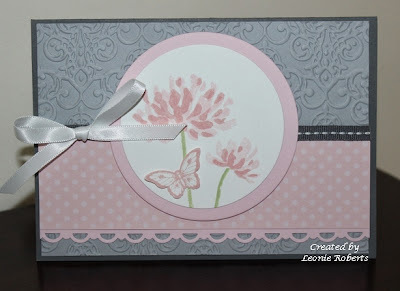 If you want to see the originals visit Jenny's site, she sells it as a class. Do you remember this little fellar from a couple of years ago. He was very popular to make using Pennant Parade and punches. 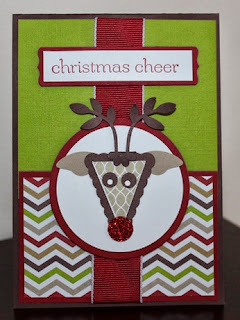 Well I have re-done him using all the current Stampin' Up! 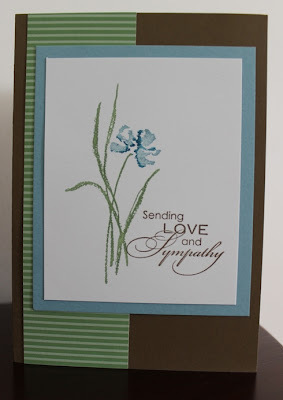 punches and propped him up on some of the lovely new products from the Stampin Up! Holiday Catalogue. I decided to make him again as I thought my sister would like him for her Christmas cards and wanted to help out my demonstrator with some samples for her Christmas Class coming up. I was really pleased with how he turned out and hope you like him too. I am sorry I can't remember who came up with the original design, but they did a wonderful job. 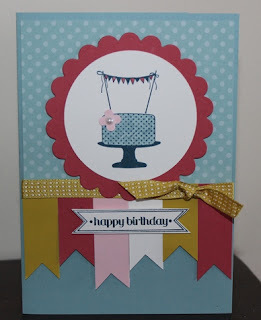 Today I am showing a birthday card using Make a cake stamp set. I just love this stamp set. I have added a few little banners as well as they seem to be the rage at the moment. 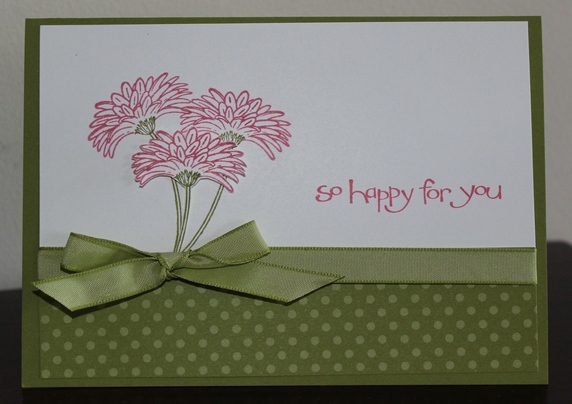 Extras: 2-1/2" Circle Punch, Itty Bitty Shapes Punch Pack, Scalloped Circles (Spellbinders), Summer Starfruit ribbon, Pearls. Today's card is using Rev Up the Fun. When I first saw this stamp set I liked it but didn't think I would use it. I was wrong. With having two boys aged 8 and 9, I think this is the perfect stamp set, not just for them but for their friends. Not to mention I also have a 5 year old, so the stamp set will come in handy for years to come. 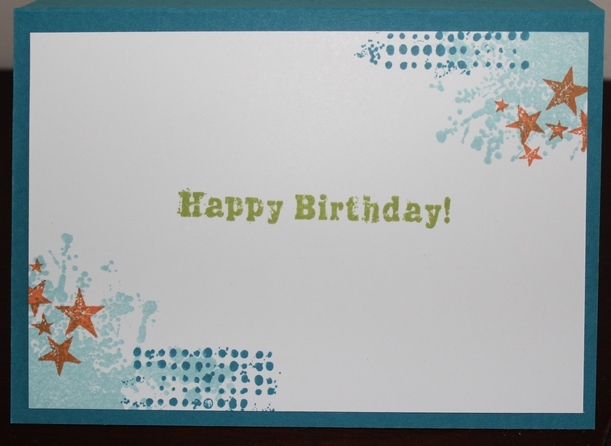 Well this card is for Jake's friend Ali who is turned 8 on the weekend. I love this colour combination. 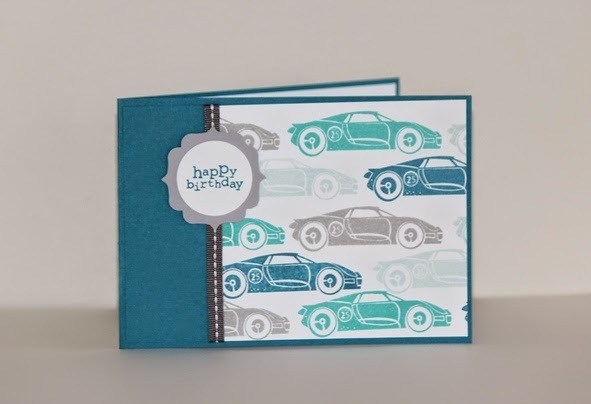 Zach told me after I made this card that this stamp set will be good for his friend Jack when it is his birthday as he loves racing cars. Looks like I will be making another one. Well I am finally posting a card after my friend asked what was going on. I have actually made a few lately so I will attempt to post over the next few days. 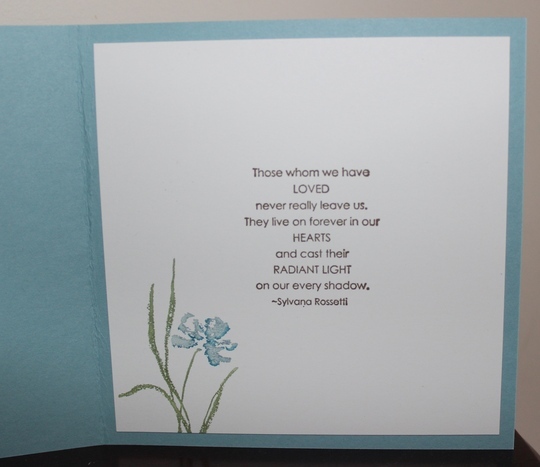 Today's card is made for my husband's Aunt who turned 80 this month. She had a party on the weekend and loved every minute catching up with family and friends. She is still very lively and can see who having a 90th in another 10 years. The card was inspired from a card Moncia Gale did sometime ago. 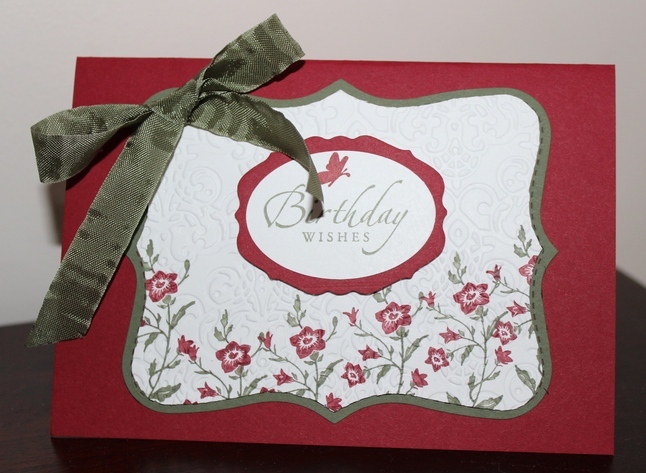 I know I have used a bit of retired items but they were fitting for the card and I need to use them. I hope you like it and I will try and be back tomorrow with another card. I can't believe it has been three months since I posted last, where has the time gone! I have been making some cards, so I thought I better share a couple I have made recently. 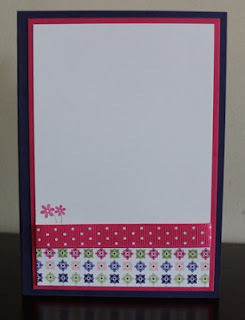 For Mother's Day I decided to make my mum and mother-in-law a box of cards, so they can use them through out the year. 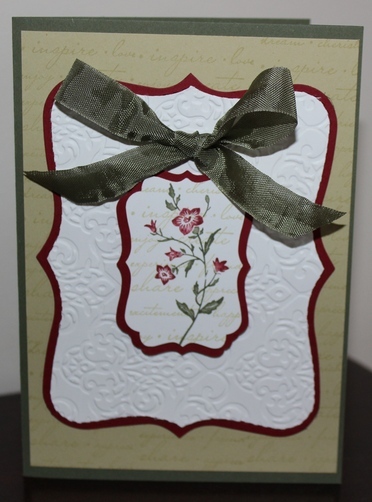 I decided on a retire set called 'Charming' and made the set of cards Jenny Moors designed, the colours of Cherry Cobbler, Always Artichoke, River Rock and Whisper White together are just beautiful. 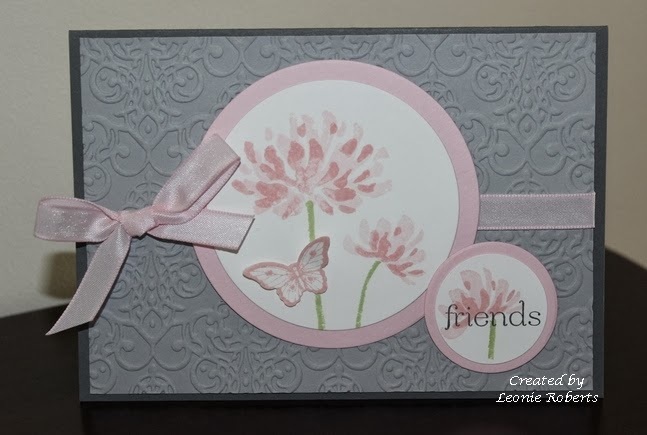 Although this set has four normal size cards and four 9.5 x 9.5 cm cards I wanted to add a couple more normal size cards, as I had room in the box. So these are my two cards I added to the set, continuing with the same colour theme. 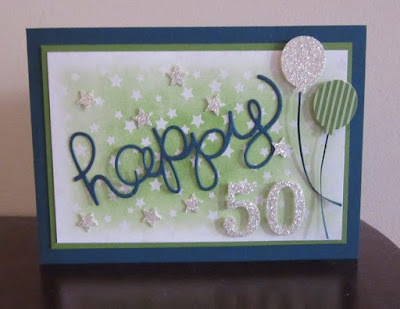 You can check Jenny's original cards out at stampingmoments.blogspot.com I just chanced my sentiment into birthday cards instead. Enjoy your day and I will try to be back soon with some more creations. 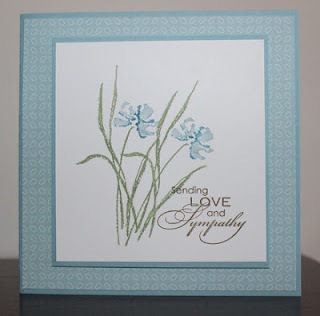 Today I am showing a two sympathy cards I had to make using the stamp set Love & Sympathy. It is always sad you have to make these but unfortuately we do. They are very simply and quick with the flower being the same on both cards but I have used two different dsp's to make them slightly different. The first one I have used Baja Breeze, Island Indigo, Wild Wasabi, and Soft Suede ink. 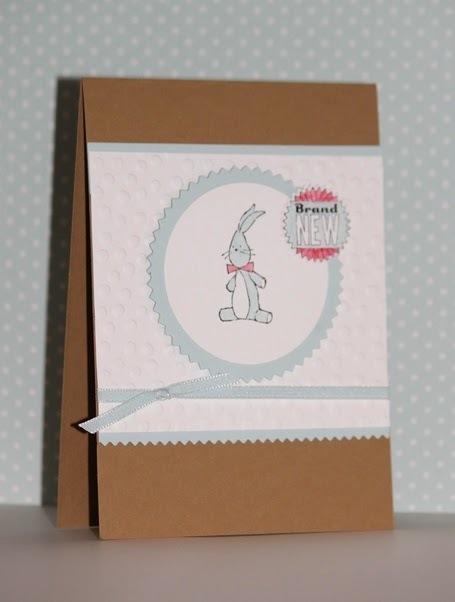 The dsp is Twitterpated, Baja Breeze and Whisper White cardstock. The second one is using the colours Baja Breeze, island Indigo, Wild Wasabi, Soft Suede and Whisper White. Well it has been a while. I hope everyone had a great Christmas and New Year and if you are on holidays - enjoying that. I have the kids at home and it is nice not having to go someone but just able to relax. Today I wanted to share a card I made using the stamp set Moving Forward. I love this stamp set, it would have to be one of my favourite and for no particular reason. I especially love the tricycle. 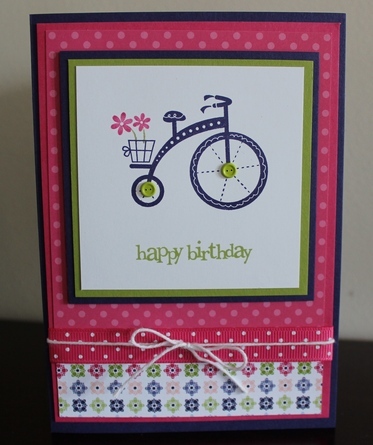 I cased a card from Mary Fish but used the tricycle instead. The colours I used were Whisper White, Melon Mambo, Lucky Limeade and Concord Crush. The dsp is Cheeful Treat (retired) but I just love the colours in it. Enjoy the remainder of you day. Today I am showing a side step card. 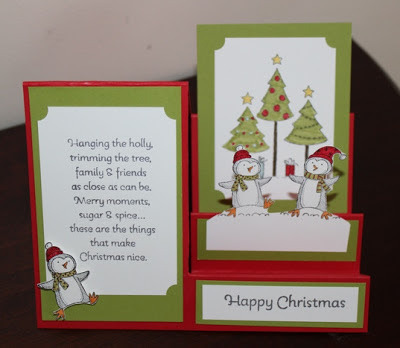 A friend made one using the Christmas Lodge (you can see it at www.thespeckledsparrow.blogspot.com.au) and I thought it looked fantastic so I decided to try one too. 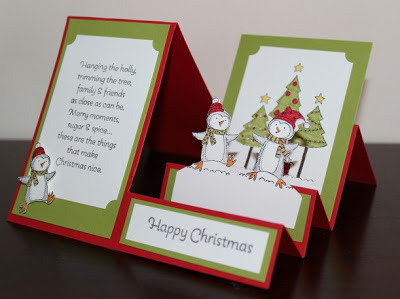 I decided to use the Polar Party stamp set as I think those penguins are so cute. The colours I used were Real Red, Lucky Limeade, Whisper White and Basic Gray. A little Daffodil Delight and Pool Party. The trees and penguins I stamped with Staz on ink and then coloured with markers. The Happy Christmas and verse is from More Merry Messages. I was please how it turned out. Even my son liked it enough that he wants it for his teachers Christmas card this year. Hope you like it too. I know it has been ages between blog entries. What can I say I have had a creative block. Well since it has been so long I thought I would give you two cards. As it is my nephews birthdays this week so I have had to try and create some cards (I refuse to buy them). My nephews are adults now one 19 and the other 22. 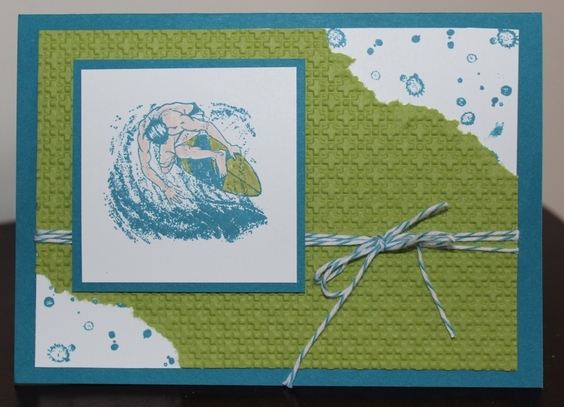 They both love surfing and one is into music, he even has a band, so I based my cards around these two things. The first one is cased from someone but unfortunately I can't remember who but I thought they did a terrific job. Both the sets I used Extreme Elements and Grunge Rock have retired but I just love this guitar. I always like decorating the inside too. The second card is also using a retired set Seaworthy but again I love this set and it is great for male cards and there isn't much around for them. 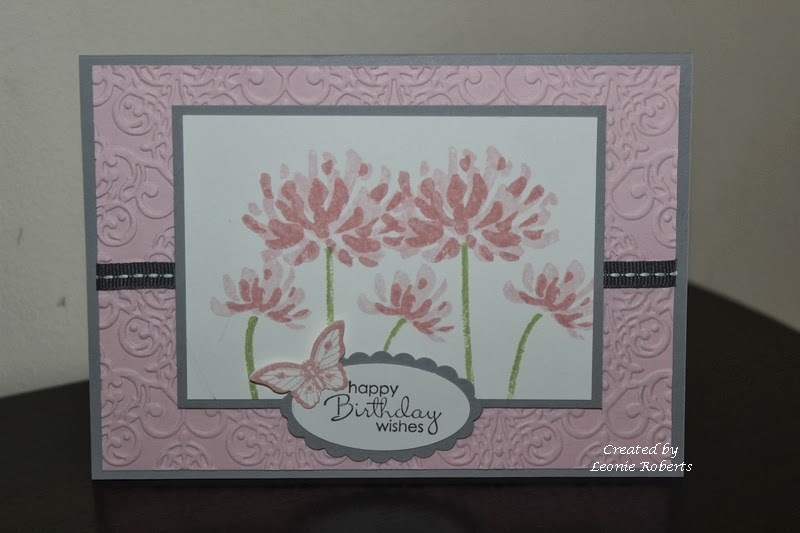 I also used the splatter from French Foliage, it looks like water spots to me and don't collapse but I tore the paper (everyone who knows my card making knows I hate tearing but I decided this card needed it, so gave it a try). Well if you can't guess the colours they are Island Indigo and Lucky Limeade, two of my favourites. Hope you liked the cards. Hi, Well what can I say but another 7 year old birthday party on the weekend but this time for twins. 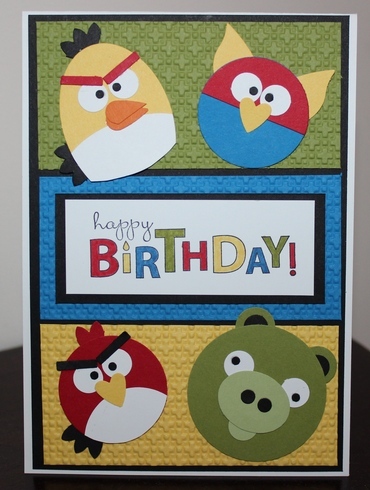 So I had to come up with two cards that were similar but not the same and of course the boys are Angry Bird mad. So I decided to do some more Angry Bird cards but wanted them different from the last ones. I also decided to create a few more Angry Birds so you will see Blue bird, Orange bird and Blue Space bird in them. Yes they now have Space Angry birds just so the craze goes that little bit further. Anyway here are my cards, I hope you like them and I would love to hear what you think so please leave me a comment if you like. As you can see there are a lot of Angry Birds here and the cards took me ages to make. Yellow bird isn't the best and looks much better with the Heart punch, so maybe next time. Punch art is fun but very fiddly and time consuming. I did make a few more Angry Birds to keep for the next party, as I know they not over yet. Maybe I should also have ago at Girl Angry birds, what do you think? I am not sure if girls are into Angry Birds. Have to check that one out. Well hope you enjoy the remainder of your day. Todays card I have done for a friend who's daughter has a birthday party to go to. She told me she wanted a pretty pink card for a six year old girl. 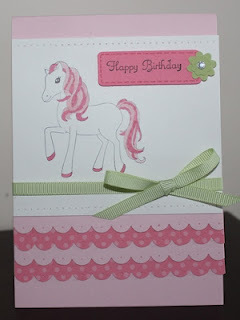 Well I suppose when I think of a pink and six year old girl I automatically think of the stamp set Pony Party, which is a bit sad that it is retiring. So I then had to think of something I hadn't done before. 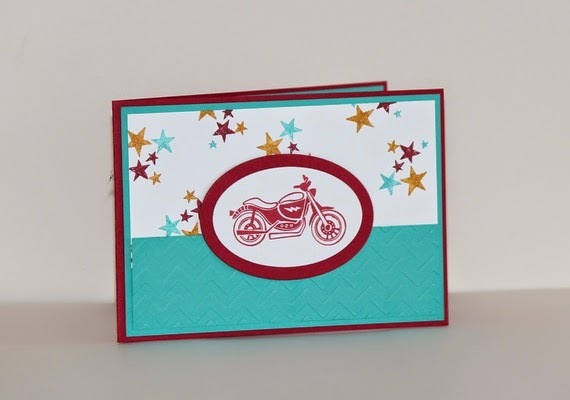 I saw a similar layout on Pinterest using the bike from Pedal Presents and based my layout on that. The colours I used where Pick Pirouette and Regal Rose. I decided to add some Certainly Celery ribbon just to add a contrasting colour. Too much pink for me otherwise. Well I hope you like it and enjoy the remainder of your day. Today I am posting a card I have made for my Stampin' Up! Demonstrator Tracy Penn who has just promoted to Executive. I decided to use the Reason to Smile stamp set as I thought the name of the set was fitting for the occasion. A promotion is definitely a Reason to Smile. You can't see it from the photo but the flower in the middle I have cut out and popped up on dimensionals. The colours I used were Whisper White, Regal Rose and Old Olive. I thought the colours looked rather nice together. The sentiment is from the retired Sale-a-bration set So Happy For You. Hi, Last weekend my middle son had two birthday parties to go to and all the boys in his class love Angry Birds. 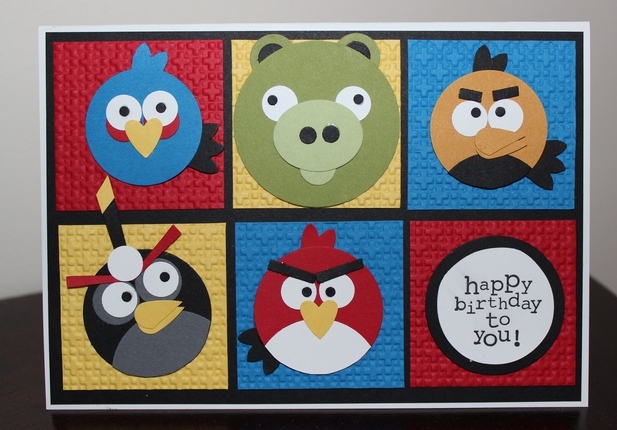 All the presents revolve around these Angry Birds from games, soft toys to t-shirts, so I decided to make some Angry Bird birthday cards as I had seen a few done on various blogs. The boys wanted one of the Angry Birds to fly through the sky and hit the pig, so this is what I came up with. 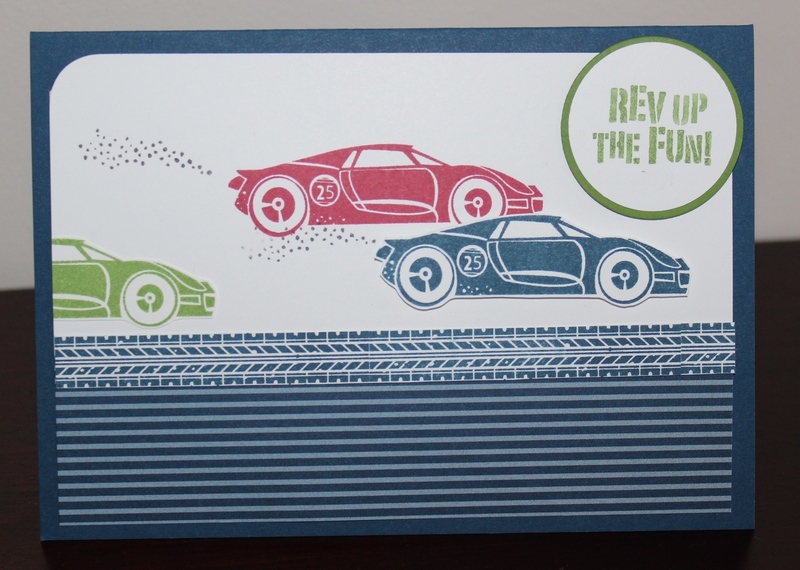 My boys were happy with the card (and so was I) so hopefully the recipient was too. Hi, a friend asked for a birthday card for a 10 year old girl, so I wanted to give her a a couple of choices to choose from which I always like to do, as we all have different tastes in cards. 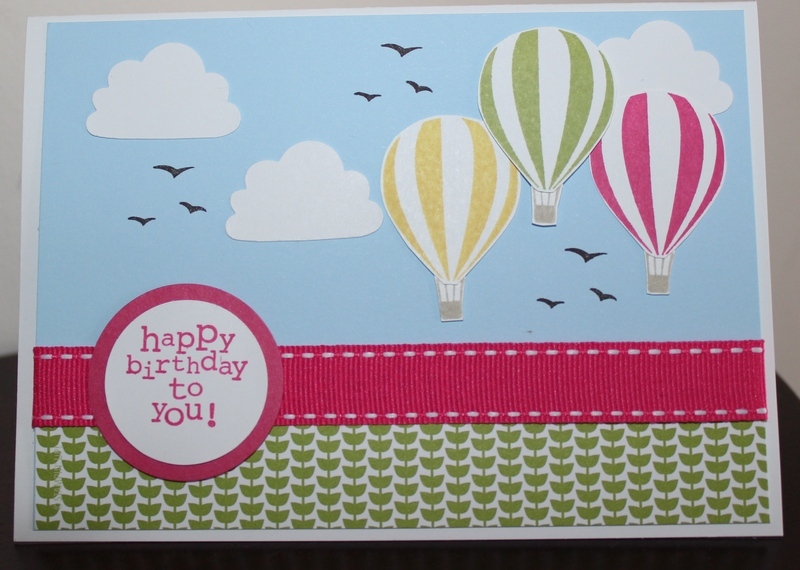 Well one of them was this really quick card using the Up, Up & Away stamp set. The colours I used were Melon Mambo, Lucky Limeade, Daffodil Delight, Bashful Blue and Whisper White. It really is just a quick and simple card. She ended picking one of the Ice-cream cone cards I showed in a previous post, but someone else liked this one.